The Coolmore Classic is a Group 1 race for fillies & mares run at Rosehill Gardens during the Sydney Autumn Racing Carnival. The Coolmore Classic, registered as the Tad Kennedy Stakes, is a quality Group 1 race held as part of the Sydney Autumn Racing Carnival in early-mid March each year. 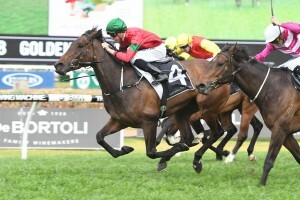 Taking place midway through this exciting carnival as the marquee race on Coolmore Classic Day at Rosehill Gardens Racecourse, this 1500m event for fillies and mares is run under quality handicap conditions and is worth $600,000. The Coolmore Classic is the richest female race held during the Sydney Autumn Carnival and is the only Group 1 race at the meeting. Coolmore Classic Day features a host of Group 2 and 3 support races including the Group 3 Magic Night Stakes (1200m) and Group 3 Pago Pago Stakes (1200m), which are the final lead-ups for two-year-olds heading towards the iconic Group 1 $3.5 million Golden Slipper Stakes (1200m). The Group 2 Ajax Stakes (1500m) and Group 2 Phar Lap Stakes (1500m) are the other two Group 2 events on the program. Key lead-up races into the Coolmore Classic field include the Group 2 Guy Walter Stakes (1400m) and the Group 2 Surround Stakes (1400m) both run in late February on Chipping Norton Stakes Day. The best out of the Coolmore Classic may go on to run in upcoming autumn features such as the Group 1 Doncaster Mile (1600m) and Group 1 Queen Of The Turf Stakes (1600m) held at Randwick over ‘The Championships’. In 2016 the Coolmore Classic runner-up Azkadellia went on to run third in the Doncaster and win the Queen Of the Turf Stakes. The 2019 Coolmore Classic takes place on Saturday March 16, 2019 at Rosehill Gardens. The latest Coolmore Classic 2019 betting odds will be available below the week of the race with autumn racing market links to Ladbrokes.com.au. The Coolmore Classic field attracts the season’s best middle-distance fillies and mares and is released on the Wednesday before the race. The official 2019 Coolmore Classic field and barriers will be released by Racing NSW on Wednesday March 13, 2019 and published in full below. The 2019 Coolmore Classic nominations are set to close on Monday March 11, 2019 and will be listed below. This race has been known as many different names over its history including the Winfield Classic, Orlando Wines Classic, Rosemount Wines Classic, Marlboro Classic, NSW Thoroughbred Breeder’s Stakes and the Fillies & Mares Classic. Miss Personality won the inaugural running in 1973 when it was a principal race. Not long after in 1980 it gained Group 2 status and was eventually installed as a Group 1 race in 1984. The high status, stakes and handicap conditions of the Coolmore Stud Classic ensure the field is always full of classy and competitive females. Outstanding fillies and mares who have won the Coolmore Classic include Sunline (2000 & 2002) carrying 60kg, Tuesday Joy (2007) and Assertive Lass (1997). See below for a full list of Coolmore Classic results going back to 2000. Time Record: 1:27.21 set by Shindig in 1998. Most Successful Jockey: J. Cassidy won four times with Satin Sand (1986), Kapchat (1994), Flitter (1995) and Shamekha (2004). Most Heavily Weighted Winner: Emancipation (1984) and Sunline (2000) with 60kg. Lightest Weighted Winner: Crimson Cloud (1976) with 48kg.